This family heritage Civil War letterIs encapsulated in archival plexi glassand beautifully displayed so both sides of the letter can be read. Note the wooden base. June 8, 2016 by Autumn Hamer. Please join us on Friday, June 3rd from 6 - 8pm for the grand opening of Paul Nebenzahl's show. Paul will also be in our Evanston Store on Saturday, June 4th from 10am - 4pm as part of Evanston Made; Evanston's month-long celebration of the arts in Evanston. Paul Nebenzahl is a writer, painter and musician who lives in Evanston, Illinois and Sleepy Hollow, New York. Paul’s collection of 50 poems, Black Shroud With Rainbow Fringes, was published by Silver Birch Press in May, 2014. Paul’s poem, Gusen Station was published in English, Italian and German in 2012 by the International Committee for Mauthausen and Gusen. As a performing multi-instrumentalist and composer, Paul has created Emmy-nominated works for film and television, and has performed extensively in theater, stage and club settings, most recently as Karen Finley’s musical director. Nebenzahl and Finley have recently performed at the Barbian Centre in Lobdon, the Museum of Modern Art and The Laurie Beechman Theater in New York City, the Richard and Karen Carpenter Theater in Long Beach, California, and the Kelly Writer’s House at U. Penn in Philadelphia, Pennsylvania. May 28, 2016 by Autumn Hamer. Evanston resident Virginia Scribner Mallard is a multi-talented artist (she prefers to be called a "painter") has won numerous awards and whose paintings can be found in private and corporate collections around the world. She has lived in Europe, South Africa and various states within the U.S. Her work has been exhibited widely both here and abroad. Born in Hartford, Connecticut, Virginia Mallard was an art teacher for many years, interior designer, technical illustrator and lecturer, she now devotes all her time to painting. The most frequent comment about her work, aside from its brilliant color, is that each piece tells a story. See her work now through October 3rd at our Evanston location. August 4, 2015 by Autumn Hamer. Evanston native Paul Nebenzahl began painting with watercolors 20 years ago. His initial subject matter was the Italian countryside. He started painting in acrylics ten years ago, and began printing his drawings done on the iPad over the past two years. His work ranges from studies of flowers and birds, of water tanks, of portraiture and of imaginary cityscapes. 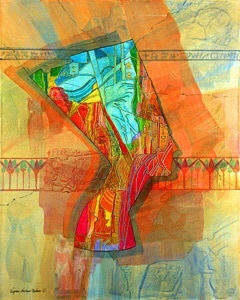 His more abstract iPad drawings have been printed on glossy photographic paper, which reproduces their luminosity well. A seasoned musician and a focused poet, Nebenzahl has always been interested in the visual arts as a means of both deep personal introspection and broad external social consciousness. 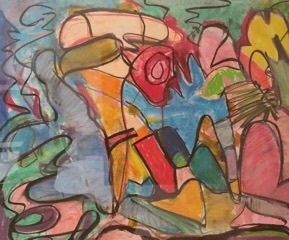 See his work now through June 15th at our Evanston location. June 7, 2015 by Autumn Hamer. Intaglio/ relief printmaking for me is a natural extension of my earlier work in leather. I’ve found that any method of printmaking can remove boundaries and allows me to continuously enjoy the materials and techniques. The relief prints have striking boldness. If one pauses for a second glance, there will be seen some wonderful subtlety as well as details in lines and shapes. High relief, earthy colors and simple concepts are my “corner stones”. I build a piece in layers, using different surfaces, materials and patterns to create depth both in form and meaning. Each layer works with and against the layer beneath it. I use printmaking techniques in order to create rich textural surface on paper and leather. The possibilities seem endless. 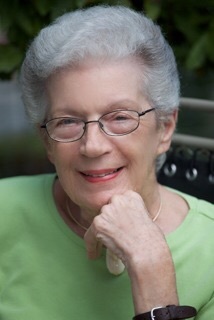 April 20, 2015 by Marian Herman.